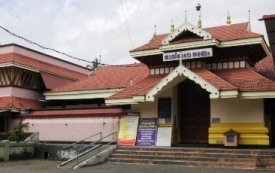 Thiruvullakkavu Sree Dharma Sastha Temple is an ancient one and famous Sree Sasta Temple in the district of Thrissur. The temple is well known for Navarathri festival and Vidyarambham. Thousands of children along with their parents vist the temple for Vidyarambham ritual on Vijayadasami day. Vijayadasami is celebrated on the tenth day of annual festival of Navaratri. “Ehuthiniruthu” (Vidyarambham ritual) in Thiruvullakkavu temple is very famous in the district. It is the Initiation into the world of letters for the children usually begins with the writing of a mantra “Ohm hari sri ganapathaye namaha” on their tongue. The ritual involves the acharya inscribing the words (manthra) “Hari sree ganapathaye namaha” on the tongue of the children with a golden ring which is to invoke the grace of the goddess of learning Saraswati. Vijayadasami day is the day of the greatest flow of devotees and thousands of children have their initiation to the world of letters. The initiation can be done any other days in Thiruvullakkavu Sree Dharma Sastha Temple, all days are auspicious at this temple. Thuiruvullakkavu Temple is one of the most important and sacred pilgrim centres in Thrissur, Kerala and is located in 12 Km from Thrissur Town on the way to Thrissur Irinjalakkuda route. The vidyarambham celebration on Thuiruvullakkavu Temple in Thrissur will start from 4.00 AM, it is expected around 10,000 children were coming to enter into the world of letters on the day of Vijayadasami Vidyarambham.